Light dinner-making just got easier than ever, with this toss-and-go Mango and Chicken Napa Salad recipe! Your family will enjoy this one-bowl meal that is packed with fiber, lean protein, and delicious healthy fats! The flavor is unique and light, creating a tasty dish your loves will ask for again! Bring it to your next gathering as a healthy, lean addition to the table! To make the dressing: whisk together the juice, vinegar, soy sauce, sesame oil and half of the sesame seeds in a small bowl. Set aside. 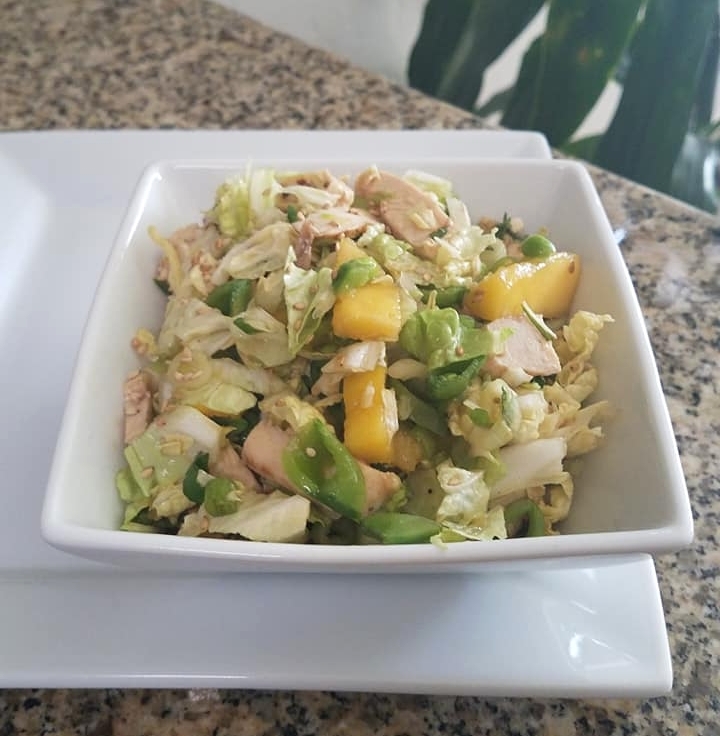 To make the salad: thinly slice up the napa cabbage and peas, toss together with the chicken, mango, mint and green onions. About 30 minutes to an hour before serving, toss everything together and then refrigerate so that the marinade can flavor the salad ingredients. Sprinkle the rest of the sesame seeds over the recipe right before serving. For the chicken in this recipe, you can either use grilled chicken leftover from a previous meal, or shredded cooked chicken made easily in a slow cooker. If you like a little heat, you can always add crushed red pepper into this recipe, or even a little bit of curry paste into the dressing. To save even more time and effort, you can always replace the Napa cabbage and sugar peas with a pre-chopped cabbage salad mixture in a store-bought kit! Toss in shredded bits of a store-bought roasted chicken and voila! You're eating dinner - EASILY! This recipe was found originally in the Eating Well magazine, and tweaked to be FRESH Start friendly...we'd love to hear what YOU think of it!